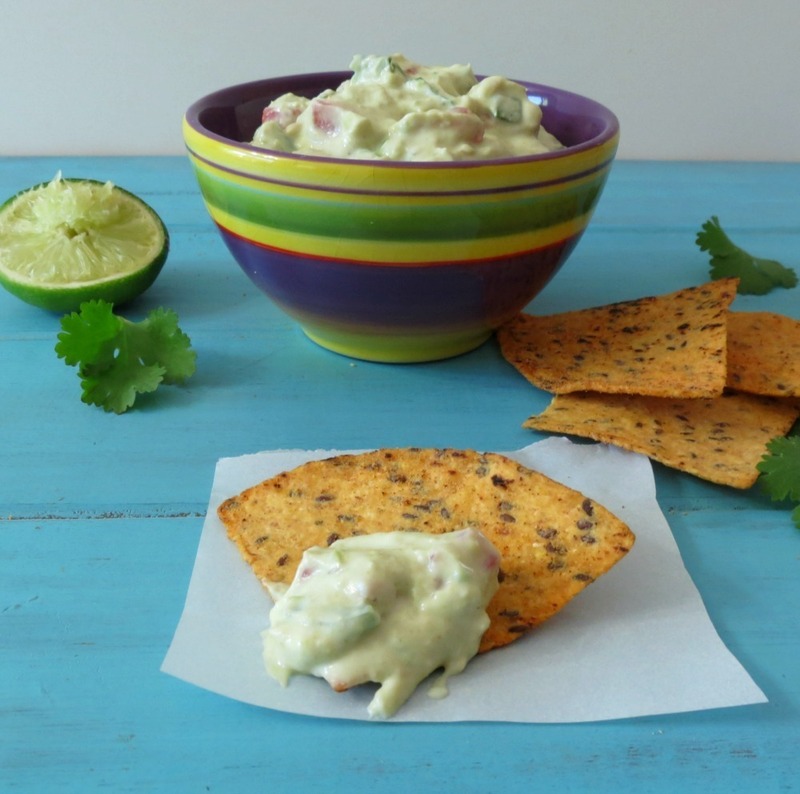 I have come up with a nice lightened up guacamole that is sure to please the pallet and the waistline. 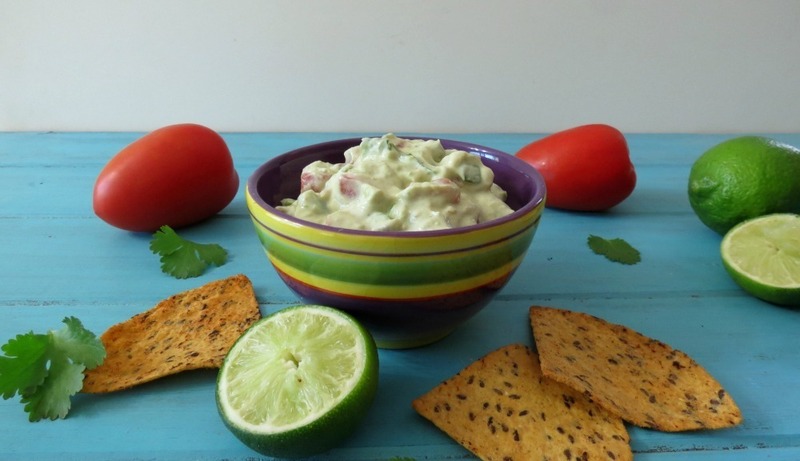 It’s creamy, has a little kick of heat and a slight zip of lime, it’s so perfect! It is so good on tacos, salads and dipping my chips in it. I can eat the whole thing and not feel horribly bad, but I will try to save a little bit, at least for a day or two. My guacamole is made with avocados of course, greek yogurt, tomatoes and some seasoning. I got the idea for this dip from Trader Joe’s. They have a nice greek yogurt and avocado dip, and I love it, but you know what, I love mine more! he he Bonus part is, it’s quick and easy to make and it costs less too!! 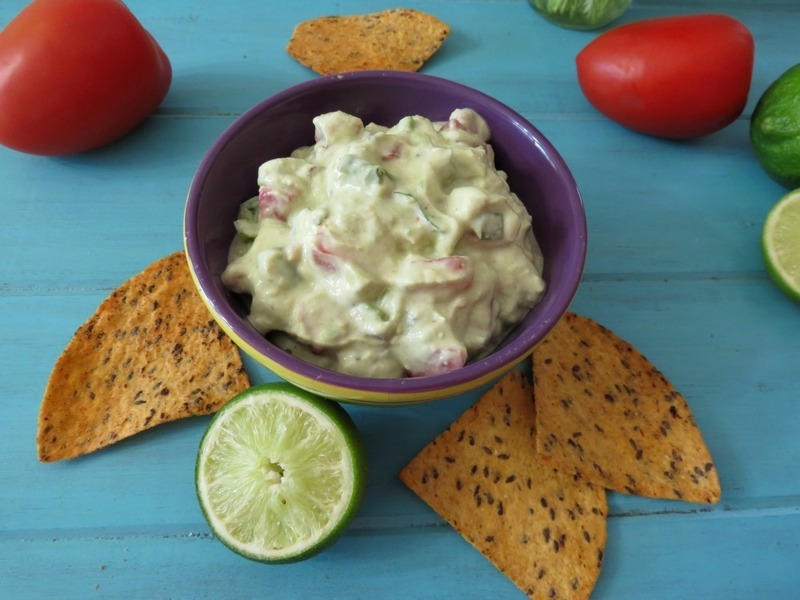 A creamy, healthy dip made with avocados, greek yogurt, tomatoes, jalapenos and seasoning. 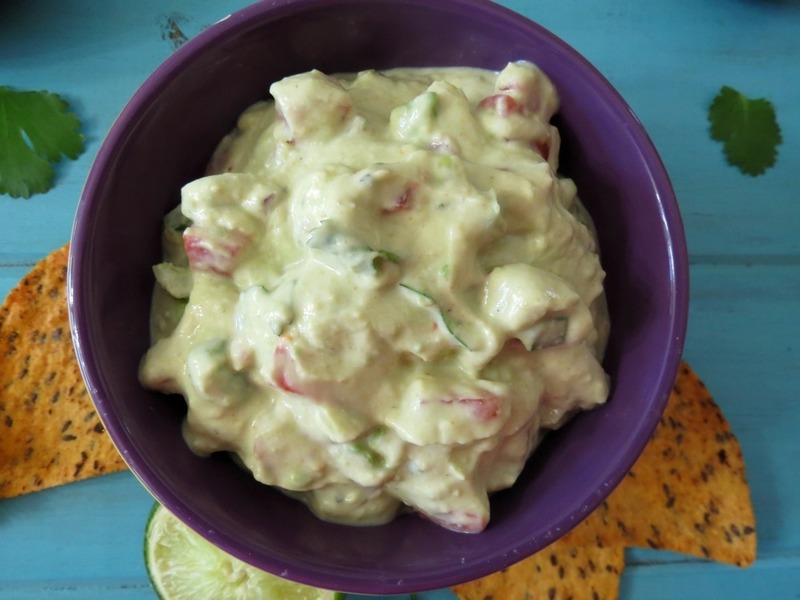 In a bowl add avocado, garlic, onion, jalapeno, cilantro and lime juice. Stir in Greek Yogurt, cumin, salt and pepper; mix until combined. I am just loving the Mexican food kick I am on. I think I use Cinco de Mayo as an excuse to make more Mexican food then normal but honestly I don’t think I need an excuse, it’s all so good!!!! Yum, yum, yum!! So what are your favorite Mexican foods? I had no idea they had a lot of calories in them. I’m going to pretend you didn’t say that. But I love that you used Greek yogurt to lighten this up! I just got 36 32oz. containers from Chobani and I need to figure out what to do with it all. This will probably have to happen haha. Hey they are good calories and a good fat! Eat away! Perfect! 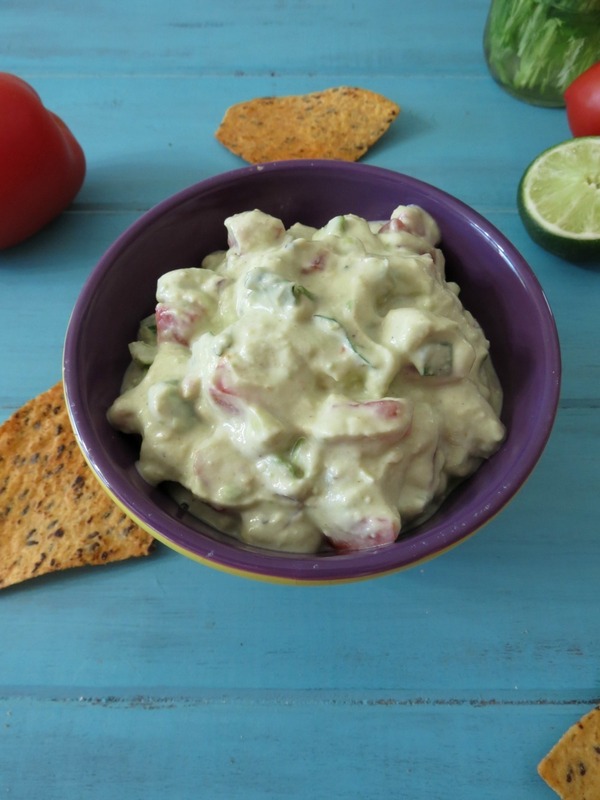 Not only does the greek yogurt cut out some of that fat, it adds a creamy texture! WIN WIN! You are a genius! I would never have thought to add yogurt. YUM. Thanks Aimee! I love your recipe too!!! Great idea Jennifer, leave it to TJ’s. right? Sounds wonderful! I know that darn YJ’s and there wonderful ideas! Avo’s have got to be way up at the top of my list of favorites. Beautiful. Funny story is that my nephew did a masters thesis on transportation of avocados (probably a lot more complex than I made that sound), yet he actually didn’t like them (to eat). How sad ! I tend to have mine with a bit of apple cider vinegar and black pepper. After that anything goes – on healthy wholemeal toast, on its own or on the side as part of a salad. Thanks for the guacamole recipe. Sounds delicious!! Ohhhh, apple cider and vinegar and pepper. I’m going to try that tomorrow. Your poor nephew is missing out on all the avocado fun! Maybe one day he will change his mind like I did.